To enable drill down and up, we rebuilt and improved our tooltip experience, and built into it the infrastructure for drill down/up. 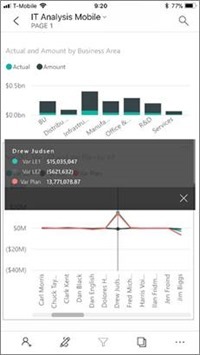 The new tooltip is screen wide, and allows scrubbing, so you can drag your finger across the visual to explore details about each data point along the way more easily. The new tooltips paved the way for on data point interactions, the first is drill up/down, which we know you were waiting for quite some time. 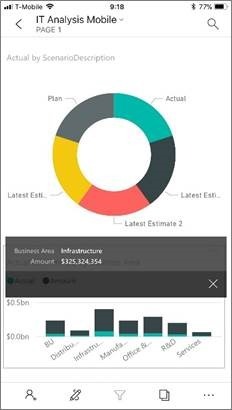 Power BI reports allow multiple hierarchies of data to allow maximum insight. 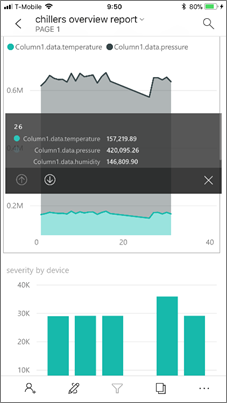 Using drill up/down on your data point you can explore more details about your data making it more useful – even on the small form factor of the phone. And now you can use the drill down/up capability just by tapping on a data point in a report visual to show the tooltip and if drill options are available, then you will see the down and up arrows in the bottom of the tooltip box. Tapping on the down arrow, will bring you the next level in the hierarchy related to the selected data point. 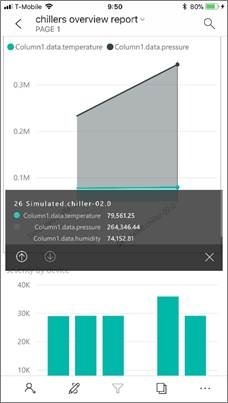 Remember, to enjoy all these drill options in the app, drill needs to be defined when you build your report in Power BI Desktop or in the web. 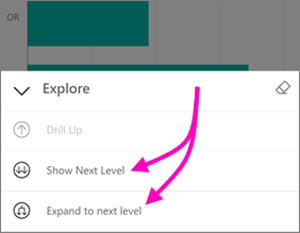 Follow this link for additional information on how to enable drill down for in report. Next in our backlog is Drill Through. Stay tuned.